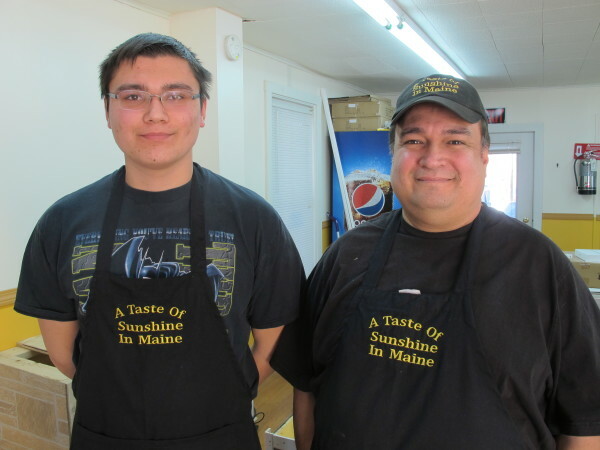 Steve Santiago, right, and his son, Steve, will open A Taste of Sunshine in Maine in Brewer this Saturday. The Cubano sandwich served a A Taste of Sunshine in Maine in Brewer. 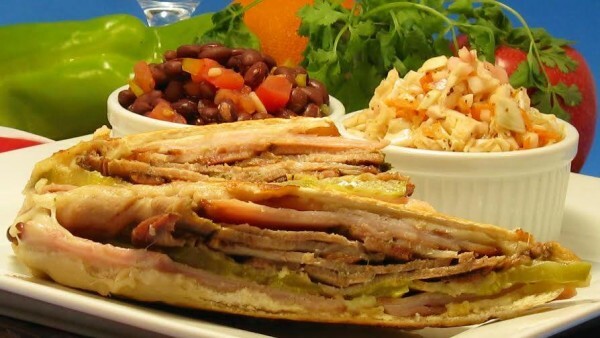 The Cubano is one of the world’s great sandwiches, right up there with the Reuben, the French dip and the Muffaletta. Sliced ham, marinated roast pork, swiss cheese, thinly sliced dill pickles and mustard, layered on Cuban-style white bread and grilled in a sandwich press — it’s a flavorful lunch native to Florida and the Caribbean, that has since found its way to eateries nationwide. Area diners will soon be able to get a Cubano anytime they want, made fresh and with authentic, local ingredients by Steve Santiago and his family at their new Brewer restaurant A Taste of Sunshine in Maine, which will open on Saturday, Feb. 6. Located at 14 North Main St. in Brewer, directly next to the Joshua Chamberlain Bridge, A Taste of Sunshine has been in the works for a long time. The idea started when Santiago, a native of New York City, retired after decades working in law enforcement and moved to Maine in 2012 with his wife and kids. Shortly afterwards, he began teaching adult education classes in Latin and Caribbean cooking at Hampden Academy. Santiago calls Anthony Bourdain his hero, and is a self-professed foodie and self-taught chef. He and his family have lived all over the United States and in several countries, and he’s tried the cuisine of every place he’s been. Whether it’s from a food truck or a Michelin star restaurant, he wants to eat it. Naturally, Santiago, who is of Puerto Rican descent, gravitated towards Latin Caribbean food — specifically the food of Cuba, the Dominican Republic and Puerto Rico. For the roast pork featured in the Cubano, Santiago has installed a smoker outside of his North Main Street storefront, where pork cuts — after soaking for several days in a special mojo marinade — will slowly cook until tender. In addition to the Cubano sandwich and a Cuban-style chicken sandwich, Santiago will offer his daughter Sophia’s special recipe for a St. Louis BLT, which is the fixings of a Cubano topped with candied bacon, tomato and lettuce, and a Jibaro sandwich, which is a Cubano topped with a crunchy fried tostone (a fried plantain, a ubiquitous and addictive Latin Caribbean side dish). A Taste of Sunshine will also offer changing daily specials, such as Ropa Vieja, a stewed beef and vegetable dish, Puerto Rican chicken fricassee, barbecued chicken featuring a house-made special recipe rub, and Mike’s Plantain Balls — a.k.a. Mofongo, Puerto Rico’s iconic dish consisting of mashed and fried plantains, shaped into a ball and stuffed with beef, chicken or shrimp. For dessert, there’s Tres Leches Cake, Chocolate and Pretzel Pie, and a Peanut Butter Pie Santiago swears is irresistible. Before opening, they taste tested a number of dishes locally, including for the Brewer School District and at Blank Canvas Brewery in Brewer. Santiago also partnered with area purveyors to supply many of the ingredients he uses — milk comes from Siberia Farms in Bangor, and the Cuban bread will be specially baked by Massimo’s Bakery in Brewer. A Taste of Sunshine in Maine, located at 14 North Main St. in Brewer (next to the Joshua Chamberlain Bridge) will be open from 11 a.m. to 6 p.m. (or until the food runs out) Monday through Saturday. The restaurant presently only offers takeout, which can be called in at 573-1700; there are also catering options. Large orders can be delivered within a 1.5 mile radius. A Taste of Sunshine has parking directly across North Main Street in the City of Brewer municipal parking lot. For more information, visit www.atasteofsunshineinmaine.com or like them on Facebook.